Washington Revels Maritime Voices celebrates the lives and legacies of the men and women who worked and maintained our nation’s 19th-century waterways. The placid waters and trails of the C&O Canal will come to life through songs and stories that were heard up and down the C&O, Erie, and other mighty canals when these economic lifelines were the engines that drove American commerce. Make a day of your Canal visit! 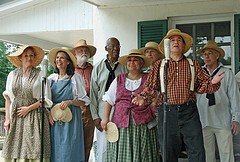 Maritime Voices will present two full concerts outside the Visitors Center at noon and at 2:00 pm, so there’s plenty of time before or after to walk or bike the trails, catch spectacular views of the falls, and relax along the idyllic canal. Kids can even participate in activities to become C&O Canal Junior Rangers. What better way to enjoy Father’s Day? TICKETS: Event is free and open to the public.